It’s not JUST Cricket! There’s a venue, spa and hotel too! The Ageas Bowl is the picture-perfect home of Hampshire Cricket built in 2001, located near Southampton, with a capacity of 15,000 people, but cricket is not the only type of event that the venue holds. The business objective was to grow through promotion of other facilities that the venue has to offer. 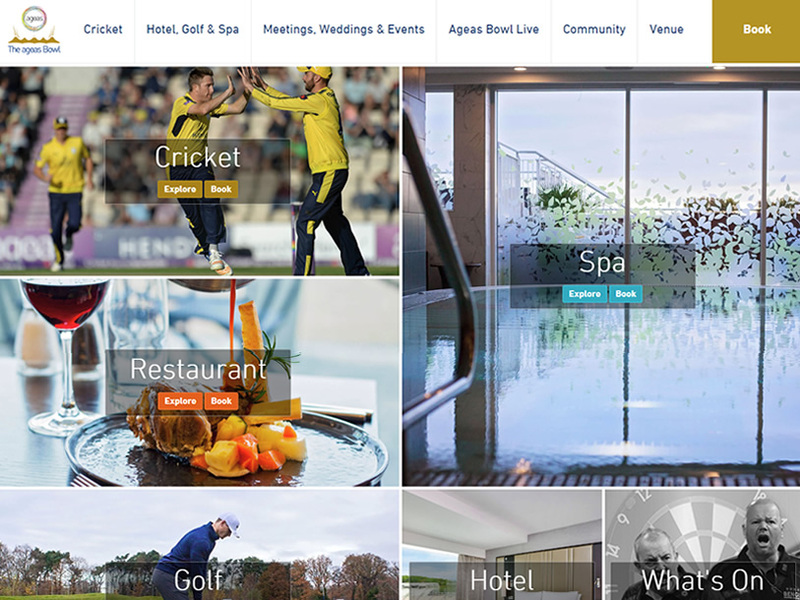 Previous iterations of the website were too focused on cricket, so our challenge was to give equal emphasis to all key areas such as the new Hilton hotel, golf course, spa, weddings, concerts and other live events that the Ageas Bowl hosts. The new website still has cricket at its heart but simplifies the user experience whilst making the audience aware of the other facilities. The Ageas Bowl hosts international Cricket matches, so we needed to consider an international audience within the design at all times. It was important for the website to provide engaging, current and media-rich news from the club. We used an array of traditional news articles with video interviews and audio as well as comprehensive coverage of fixtures and results. These were delivered by ‘Opta’ data, making the cricket page dynamically update with live score cards for fans to follow and also a live radio stream to listen in real time during match days. The main image on the cricket page is context aware to display the latest in-game information and statistics, updating every time the ball is bowled, so the audience can enhance their experience with the venue. Being optimised for mobile and tablet devices means that the venue’s website is always accessible to everyone everywhere, whether they have made it to the match or not. 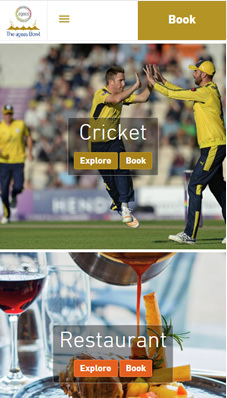 Launching at the start of the cricket season and the opening of the Hilton, the new website has helped to engage fans and the wider community to increase interactivity with the Bowl and drive awareness for the wide range of facilities. As well as being a finalist for the Consumer Website of the Year award for Wire Hive 100! Howzat! Public Health Dorset, via its LiveWell Dorset service, wanted to educate the residents of Bournemouth about the lifestyle and social effects of drinking, encouraging as many people to make small changes to their drinking habits or talk about their drinking with a friend, family or health professional. Get fantastic results for your own project! Drop us a line, we'll take it from there.